This handmade paper making couch is a speciality piece of equipment for transferring the brand new paper sheets off the mold. This specific design will easily accommodate a paper mold up to 22" by 20". More details of the handmade paper making process can be found in my description of a paper plant. This is simple woodworking project, but is only one small part of a larger handmade paper plant. The materials cost around $100.00. After you request and receive the four sketches, these notes will help you understand them. This sketch shows the side and top views. Not the curved top. The paper couch is basically a small heavily build table with a curved top that is adjustable in height. 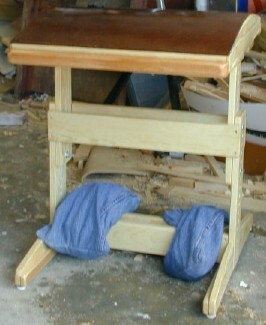 This front view shows the adjustable leg column and the placement of the sandbag. This sketch shows the wooden parts of the couch. Most are made from 1"x4" pine. The rest were made from scrap wood. This sketch shows the four pieces that are made from scrap plywood and the top which is made from smooth tempered masonite. The paper making couch is made from pine and scrap plywood. The parts are assembled with glue, screws, and nails. This is only an estimate (made in Winter 2007). The price may vary in your area. Using as much scrap wood as possible will help keep the price down. This device was designed so that it could be built by one person with a modest home shop. Access to a table or radial arm saw is helpful. Little skill in woodworking is required. This is not intended to be a detailed step-by-step construction guide, but rather a number of points to consider. It is your project and you can build it to suit your likes. Size -- The top of the couch needs to easily handle the largest felts you plan to use. The felts are generally 2 inches each way larger than your largest mold. Making the couch grossly oversized so that it would handle large projects in the distant furtures makes it hard to work with and store now. Height -- The couch needs to be at a convenient height for the specific worker. This one can be adjusted over a reasonable range. If your worker is very tall or very short you may need to adjust this design. weight -- In normal use the workers may push on the couch fairly hard. It needs to be sturdy and the extra weight of the sandbag in the base helps a lot. This is very basic woodworking. The curve for the top pieces can be made by bending a thin strip of wood around a few nails. The two wooden sides and the three internal plywood pieces need to have the same curve. The curved pieces fit into dados in the front and back pieces. The assembly is reinforced with a plywood plate on the bottom. The rest strips on the front and back give the worker a place to rest the end of the mold while setting the deckle aside. They can be made from scrap wood. The top is made from tempered masonite 1/8" thick. The tempered version is more water resistant. Cut it a little large and attach it with finishing nails and glue. Start at the middle and work both ways out to the front and back. Trim off the excess masonite after the glue sets. It is a lot easier to use the couch if it does not tip away from you when you roll on a piece of new paper. You can simply place a sack of river gravel on the lower cross-pieces, but a proper sandbag works better. Sandbags are in fact very good tools to have around a woodshop as long as they are not actually filled with sand as the loose grit will dull your tools. One pair of old blue jeans will make four nice gravel bags. Simply cut the legs off and then cut our the knee area which is usually worn out anyway. Turn the 1/2 pant leg inside out and sew up one end and about 2/3 of the other. This can be done by hand. Turn the leg back right-side out. Buy a sack of round river gravel about 1/2" in diameter. Put it in a bucket and wash off all the sand. Dump the gravel out on a clean surface and let it dry. Fill the 1/2 pant legs 3/4 full of clean gravel, do not over file, and sew up the top. Paint your couch any way you want. The top needs several coats of polyurethane varnish. You can paint the base of the couch any color you like. Oil based paint helps resist water better. The masonite top need to have multiple coats of varnish until it stops soaking up the varnish. Use at least three. It also helps to varnish the front and back of the top too so that paint does not transfer to your molds. Thanks again for using Woodware Designs Plans. We very much want to know how you are getting along with your project and will be happy to answer any questions by email.